Paddlers should be aware that the waters of the Lower Nimpkish River can be swift and may contain hazards such as strainers and sweepers. Proper precautions should be taken when traveling this river. Bring your own drinking water as potable water is not available in the park. All surface water from the river must be boiled, filtered or treated prior to human consumption. Rustic Lower Nimpkish Provincial Park comprises a corridor of land centered on both sides of the Lower Nimpkish River, extending about 4 km from the north end of Nimpkish Lake, southeast of Port McNeill on northern Vancouver Island. The corridor is, wherever possible, about 300m wide on each side from the centre of the river, which runs through the park but does not fall under BC Parks jurisdiction. This undeveloped wilderness park offers opportunities for fishing and nature appreciation, and helps to protect important riparian habitat containing Bald eagle nesting sites and habitat for Marbled Murrelet, a threatened species. Lower Nimpkish Provincial Park is located on northern Vancouver Island approximately 5 km south of Port McNeill in the regional district of Mount Waddington. The park can be accessed from the north from the subdivision of Nimpkish Heights, just south of Port McNeill. There is no formal trail access from this area and it is not recommended. The park can also be accessed from the south by foot or by canoe or kayak at the north end of Nimpkish Lake. Paddlers should be aware that the waters of the Lower Nimpkish River are known to be dangerous and should take proper precautions. Cultural Heritage - Lower Nimpkish Provincial Park lies within the traditional territory of the Namgis First Nation. The park contains a portion of a First Nations traditional cross-island trade route known as the Grease Trail. Conservation - The park contributes to the representation of submontane very wet maritime Coastal Western Hemlock variant gap in the Nahwitti Lowlands ecosection and the Northern Vancouver Island ecosection. 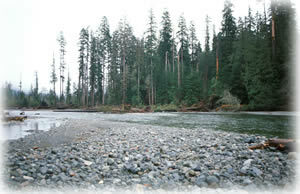 It provides anadromous fish habitat and protects important riparian habitat containing Bald eagle nesting sites, as well as habitat for the Marbled Murrelet, a threatened species. Approved Management Direction Statement [PDF] for Lower Nimpkish Provincial Park is available online in pdf format. There are opportunities for paddling at Lower Nimpkish Park, however BC Parks does not manage the river (the river is not part of the park) and does not recommend canoeing, kayaking, tubing or swimming as the waters of the Lower Nimpkish River are known to be dangerous and may contain hazards such as strainers and sweepers. Proper precautions should be taken when traveling this river. The park is a popular destination for fishers searching for Sockeye, Coho, Chinook pink and chum salmon, as well as steelhead, Cutthroat, Dolly Varden, Kokanee and Rainbow trout. Anglers should be aware that black bears frequent the area along the river’s edge, especially during spawning season. All anglers should check the current regulations issued by Fisheries and Oceans Canada prior to fishing. Anyone fishing or angling in British Columbia must have an appropriate licence. There is no designated swimming area at this park. Visitors choosing to swim should be aware that the waters of the Lower Nimpkish River, which runs through the park, are known to be dangerous. There are no lifeguards on duty at provincial parks.